Looks like a similar product to Rain-X. I've never tried it on my bike, but have used it on the cage. It does work well, eliminating the need to use the wipers in light rain. I never really thought of putting it on the bike's windshield, but it seems like it'd be a big help, since we have no wipers at all. I hope you follow up with a review. I also hope you don't do too badly in the weather on your trip. Have a good time & ride safe. I always treat my helmet shield and windshield with Rain-X before a trip but I don't notice much of an improvement. Rain-x isn't for plastics, only for glass. Thats why you don't notice any improvement; I tried as well. 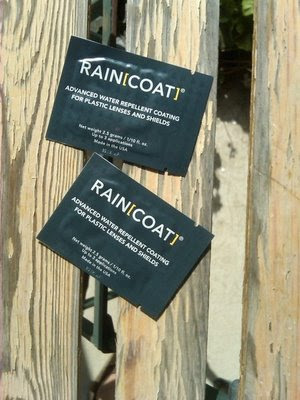 This Raincoat is made just for plastics. I'm going to order some and see how it works too. Exactly! RainX works on glass and not on plastic. Raincoat works on plastic and will not work on glass. So did it work on your trip? I would just like to ask you that had this raincoat worked for you during your trip? ?